We had a long day! Our flight out of Newark was delayed for almost two hours. Luckily, we had some time to spare before we got on our flight from Houston to Mexico. Arrived around 6:15 pm and after some time exchanging dollars for pesos, we boarded the van with Rogelio and headed to Guanajuato and El Meson de los Poetas around 8 pm. With what little energy we had left, we walked down to the Jardin de la Union (Central Square) to have a great dinner at La Trattatoria. Afterwards, we went over to where the minstrels were playing and then took a loop through the Square before heading back to the hotel. We were all exhausted. Tomorrow we get to play tourists by going to Alhondiga and Delores Hildago. The US turns there clocks forward Sunday morning, but Mexico will remain the same, so now there will be a two-hour difference. No signs of snow here!! We had a busy day! We began our morning at 8:30 am (so much for spring break!) with the wonderful hotel breakfast and then headed out to "Alhondiga de Granaditas" (The Public Granary), a museum depicting murals and artifacts from the Mexican War of Independence and beyond. In September 1810, Miguel Hidalgo, a priest from Delores, gave the famous "Grito de Delores" (cry or shout for Delores) calling Mexican peasants and farmers to rise up against Spanish rule. He along with Ignacio Allende (a military officer) gathered thousands of people and captured various cities in Guanajuato (San Miguel, Celaya). In late September, Hidalgo and 5,000 supporters arrived in the city of Guanajuato, where Juan Antonio de Riano, a Spanish quartermaster, had locked himself in the granary along with hundreds of others including wealthy Mexican supporters of the government. A legend is that a local miner named Pipila, who was noted for his strength, strapped a stone to his back to deflect gun shots from the Spaniards, made it to the front door of the granary and set it on fire. The insurgents stormed inside and killed Riano and all the others. Over the next six months, Hidalgo and Allende along with Jose Mariano Jimenez and Juan Aldama went on to conquer other towns and cities in Mexico until they were eventually captured by the Spaniards in 1811. All four men were later executed and decapitated; their heads were displayed on the four corners of the granary in order to symbolize what happens to people who rise up against the government. Their heads were on the granary for ten years until the Mexican people gained their independence. The remains were later transferred to Mexico City and placed in monument known as the "Angel of Independence." 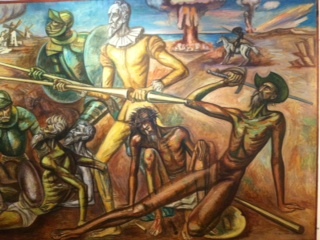 The murals inside Alhondiga portray the history of this fight for independence. After Alhondiga, we loaded into a van and drove an hour to Delores Hidalgo, the town where Miguel Hidalgo lived. 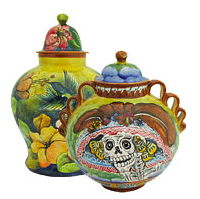 We talked the van driver into stopping in Santa Rosa along the way so that we could go to "Majolica Santa Rosa"--the famous pottery factory and store. This Spanish-influence pottery is known for its glaze and free-form designs. Each piece is handmade and depict local icons as well as figures from nature. After we arrived in Delores Hidalgo, we had lunch in a small restaurant called "El Carruaje del Caudillo" where we had a delicious buffet of chile relenos, chicken with mole, cilantro soup and many other Mexican dishes. A talented musician played the keyboard and sang throughout our time there--it was wonderful. We then visited the church where Hidalgo gave his famous "Gritos de Delores" and got a chance to walk around the central square and visit the many shops that surround the plaza. At the end of the day, we headed back to El Meson de los Poetas, our home away from home for the next week, and our magnificent view from the roof top of the hotel. Tomorrow we meet with the students and faculty at the University of Guanajuato! 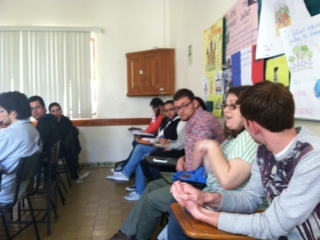 Today was our first visit to the University of Guanajuato Language department. We met with Dr. Luzma Munoz from the Department and Roberto from the International Education department to get an overview of the University system. It is one of the oldest universities in Latin America founded in 1732 as the Hospice of the Trinity and went through several name changes over the years to arrive at its current name. Similar to Penn State, the University of Guanajuato (UGto) is a top public research institution geographically dispersed throughout the state of Guanajuato offering undergraduate, graduate and professional degree programs. It has over 33,000 students (9,000 of them are at the Guanajuato campus, which is the main campus of the University system). Unlike PSU, though, UGto is also responsible for 10 different high schools in the State, which adds another 12,000 students into the system. One of the highlights this morning was that the Penn State students, Rob, Chris and Crystal, got a chance to present (in English) an overview of the American educational system to UGto faculty and students. They did a great job with the PowerPoint and providing details about each of the levels (elementary, middle school, high school and post-secondary) as well as about assessments in schools and about preparation of teachers. They even put in a plug for THON! The audience was very attentive and understood what the students presented and even laughed at their jokes. The UGto students and faculty had a chance to ask questions at the end and a lively discussion about the similarities and differences between the two systems ensued. Afterwards the PSU students met briefly in small groups with UGto students to ask and answer questions. After the presentation, the PSU students were given a short mini lesson about the Spanish language so that they could use what they learned while they are here. Two of the students, Daniella and Luis, then went out to lunch with the PSU students and took them on a brief tour of the city. They rode the funicular to the top of the mountain where the statue of Pipila stands over all of Guanajuato. They even got a selfie with the students while they were there as well as a beautiful panoramic view of the city itself. Guanajuato is a World Heritage city with cobblestone streets and small narrow alley ways that twist and turn all around the city. The church in the middle of the panoramic picture is the Church of the Basilica of our Lady of Guanajuato, a cultural landmark in the center of town. Even though it rained heavily at the end of the day, it was still a great city to explore. After returning to the hotel for a short break, we headed out for dinner at one of the best authentic Mexican restaurants in Guanajuato--Casa Valadez. (You know it is good when everyone gets their cell phones out to take pictures of the food!) We had the best arranchera (steak) and incredible desserts (the flan was amazing). It was great to get a chance to reminisce about the activities of the day and make plans for tomorrow in this wonderful atmosphere of good food and music. We will have our first visit to a local public middle school tomorrow where the PSU students will have an opportunity to attend three different classes where English is being taught to students. It should be another great day! The day began with us taking a taxi to Quanax-Huato Middle School in Embajadoras (a region of Guanajuato). It was neat to be inside this open air school and see all the students in their uniforms bustling to the different classrooms. Tere Guiteirrez, a teacher of English at the school and a participant in the summer program taught by Sammee (a teacher consultant in the Penn State Lehigh Valley Writing Project), welcomed us into her classroom and even convinced another one of her colleagues to allow us to participate in their lessons. Several of us went to Tere's first level class (which is seventh grade) where the students were reading and responding to a lesson about teenagers. Tere is a wonderful teacher. She commands respect from the students and it is obvious that she cares for them and their learning---and they respond to her because of that kind of warmth and attention. She asked the students at first if they wanted to ask us questions in English. They were hesitant and a little shy about speaking English, but eventually some of them asked our names and what we like (such as, "What kind of vegetables do you like? or "Do you like to play sports?"). Tere then asked them to work directly with us and ask questions about the passage they had read about teenagers. This was not an easy informational text for these English language learners to read and understand, so we spent some time explaining some of the vocabulary. Afterwards, the students were so excited to have met and talked with Americans that they all brought out their cell phones and asked if they could take pictures. The attention was really neat. Soon all the other classes had heard that the "Americans" were visiting and they asked to be part of the pictures as well. The Penn State students were so good with the middle school students, working earnestly to help them understand what they were reading and answer the questions from the text. 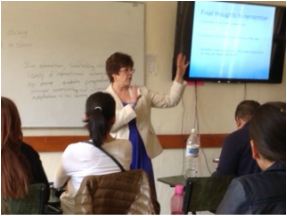 In 2009, the Mexican government developed plans to implement English instruction in the primary grades by 2015. Prior to this edict, students were required to take English in 7th through 9th grades, so not all students in Tere's class have been exposed to English instruction at the elementary levels. It is challenging, to say the least, to work with a variety of ability levels in one classroom, but Tere uses a lot of different strategies to help students develop these language skills. During one of the breaks between classes, Rob joined a bunch of the boys in a make-shift game of soccer, with one of the desks serving as the goal. It was marvelous to see how the students were delighted to be playing and how they included Rob in the match. We had to stop and ask them to go to their classes because they kept playing long after the bell had rung! In the next two classes, the level 2 students (8th grade) were learning about communication and how much it has changed over the years with the advent of different technologies such as Facebook (which they all know about and use! ), Twitter, Skype and texting. Although they might not have known the English equivalents of these words, they certainly understood what the words meant when we used various gestures to explain them. The students were very appreciative of our help. (One of them even drew a picture of Sammee complete with glasses and umbrella!) We, too, learned a lot from them about what it takes to support English language acquisition in our US schools. According to the National Center for Education Statistics, the number of English language learners (ELL) in public schools has grown dramatically. Almost 11 percent of public school students in the United States (over 5 million) are ELLs and the need to have teachers prepared to work with these learners is crucial. The PSU students on this trip are practicing for this future and learned a lot today about how important it is to use strategies that will help these learners succeed. 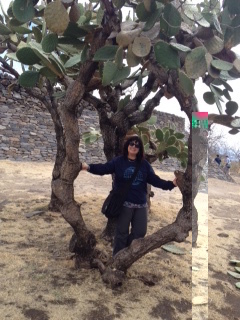 After our school visit, we went on to explore the environs of Guanajuato. This is an amazing city in so many ways. At first, we went to the El Callejon del Beso (or the Alley of the Kiss). Although there are many variations on the story, legend has it that a rich man in Guanajuato had a daughter who he wanted to marry a rich man. However, she fell in love with another man who lived in the house next door to them. One day, the rich man found them kissing across the balconies and became very angry. The boyfriend, in trying to defend the daughter, fell over the balcony to his death. Distraught, the rich man turned on his daughter and killed her. Today, it is believed that if you go to this alley as a couple and kiss, you will have 15 years of good luck. After the visit to the Alley of the Kiss, we headed to the Mercado Hidalgo (Hidalgo Market). It is rumored to have been intended as an old railway station that has converted into a place where various vendors can sell anything from chicken feet to leather belts and other trinkets. We started out on the second floor of the building that houses various vendors and overlooks the food and merchandise stalls below. It is a place like no other in Guanajuato, and many people visit this market on a daily basis to purchase a variety of goods. 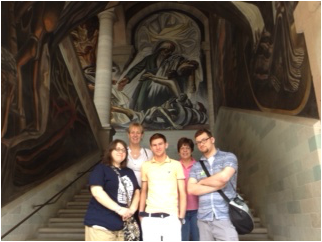 After the Mercado Hidalgo, we headed to the Diego Rivera Museum, which is the house where the famous Mexican painter was born. 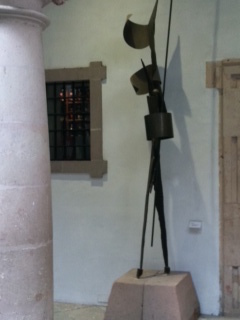 Inside this small, three story building is the story of Diego Rivera's work and life. 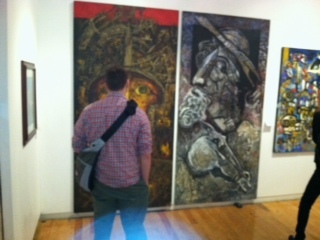 Many know him as the husband of Frida Kahlo, another famous artist. The museum includes artifacts from his boyhood home as well as paintings, portraits and landscapes from various periods of his life. We ended the night with dinner at Mestizo, a restaurant right up the road from the hotel. John Fries, a professor at Southern Oregon University (SOU) joined us. SOU is in Ashland, which is a sister city to Guanajuato, and SOU has been working with the University for about 30 years. 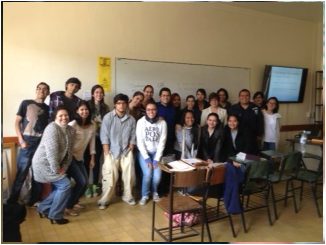 John teaches an online marketing course to SOU and University of Guanajuato students. The students begin the course in February and then he comes to Guanajuato to meet face-to-face with the University students in March. The restaurant itself was in this tucked away place but once you enter it, you can see how impressive it is---and the food was fabulous. Today was a tour day. We left the hotel mid-morning and travelled to the Peralta Ruins---about a 90 minute van ride from the hotel. What an amazing place! It was definitely worth the long ride. Archeologists date the site back to between 300 and 900 A.D., but what is incredible is that the stone structures were not uncovered until 2002. The guide provided a general orientation to the excavated site and the various formations. Probably one of the most incredible aspects of the site besides the huge pyramids was the layout of some of the stonework. One formation was apparently a sundial at one point, perhaps ranging in height to about 10 feet tall. There also was a sunken area, which might have been a pool at one time. The structures themselves were well-preserved overall and will be an attraction to archeologists for a long time. In fact, a group of archeologists is scheduled to visit tomorrow to continue excavating the site. On the way to our next stop, we went to an authentic Mexican restaurant in the town of Penjamo. Although there were not a lot of people when we were there, Lupe (the person who drives the van) said that on the weekend the place gets packed. It is not hard to see why. Not only is the restaurant beautiful, but there is a playground for children as well as a variety of games and a zoo. And the food was great too! We arrived at Correlejo in the mid-afternoon and were greeted by Victor, an English-speaking guide who would provide a tour of the Hacienda. 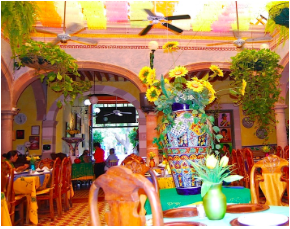 The entrance to the Hacienda was magnificent---there were flowers of different colors all around as well as their signature windows, which consist of brightly colored bottles. In the first room among the barrels of tequila, Victor explained the different grades of tequila and how they were processed. From the barrel room, we went over to the processing area where the main part of the agave is cooked. From there we walked over to the vats used to distill the mash into the first line of tequila, which is about 80 percent alcohol. From there it is further refined into various levels of tequila. The longer the tequila is in the barrels, the smoother the taste (and the more expensive it is!). Along the way, we heard various stories about the Hacienda, which was never handed down generation to generation, but rather was sold. (Correlejo Tequila has owned the place for only 18 years.) Interestingly enough, this was the actual birthplace of Miguel Hidalgo, the Father of Mexican Independence. During the Spanish occupation, many of the inhabitants of the Hacienda were forced into hiding, and in some cases, the women and children took refuge in between the walls of the house. Correlejo has turned the original part of the Hacienda into a museum, which includes an immense bottle collection (and not just tequila). It was fascinating to learn about the process for making tequila, which is an important export product of Mexico. On the way back to the hotel, Lupe took us into Guanajuato a new way and we got to see the governor’s palace as well as a pretty swanky part of town. We even passed the “Normales” institute, which prepares teachers to work with elementary and secondary students. From there, we wound our way around various back alleys until we arrived at our hotel. All in all, it was an enlightening and educational day. Tomorrow we are off to the schools again including a visit to a middle/high school and a primary school. One of the most striking features of Guanajuato (which means, "place of frogs" in Tarascan) is the tunnels that are located throughout the city (the San Juan tunnel is just outside our hotel). Originally, Guanajuato was built on a river which flowed through the tunnels underneath the city. In the mid-twentieth century, a decision was made to redirect the river because the city kept flooding. The tunnels were then converted into cobblestone roadways and walkways throughout the city. 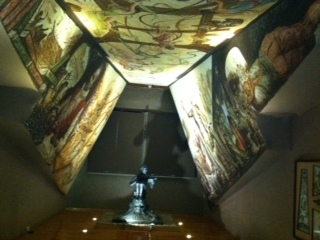 In many of them, you can see murals and other decorations. We started our day by walking through the tunnel by our hotel to the Instituto Montex de Oca, a private middle/high school in Guanajuato. There we met Ivan, a middle and high school teacher of English. He met with us ahead of time and shared his lesson plan with us for his middle school students. One of the assignments that his students must complete is to put together an information manual in English about how to handle a crisis. He was providing some instruction to support this bigger picture by having the students work on steps involved in posting to Facebook. It was a wonderful lesson in "I do, we do, you do" as the students were shown Ivan's example and then asked to do an example as a class before having to put together their own for homework. The Instituto middle school was an interesting contrast to the public middle school we visited on Tuesday. For one, the class sizes are much smaller. Ivan had 24 students and a lot of room in the class; Tere had 40 students and there wasn't any extra room. Also, Ivan used technology with his lesson. He also said that the students have been learning English for many years (some even have private tutors) and it was obvious that they knew English and could understand it. Ivan likes to teach outside when possible, so he took them all out to read from a passage in their required text. The students will have to answer comprehension questions on their own, so he did a lot of scaffolding using Spanish to explain vocabulary and concepts. The administration was so wonderful to us---they gave us freshly squeezed orange juice and freshly cut watermelon as we left to go to our next school. Mariel spent 7 years of her life as a child in Phoenix, Arizona, so she understands the importance of being bilingual. Her classroom is full of different posters and pictures in English---quite a difference from the bare walls we saw in the other two schools because the teachers have to travel from one class to the next (the students do not travel from class to class). It is obvious that Mariel loves what she does. She welcomed the students into the class and, as with Tere and Ivan, the students seemed to really enjoy being a part of her class. In many ways, they were typical 11 and 12 year olds—--full of energy and enthusiasm. Mariel asked us to introduce ourselves to the class and then she was ready to go. The total time for this class was one hour and 50 minutes. A typical teacher in the US teaches for 45 minutes unless they have a block schedule, but even that is only 90 minutes and not 110! Mariel said that she actually likes having that much time at once with the students. When the students entered the classroom, the lesson plan for the class time was on the board in English. They began with a short video on frequency adverbs, which she reviewed prior to showing the video using her iPad to stop at various points and ask the students questions as well as have them write answers on the white board. The students were very attentive and clearly understood the difference between always, sometimes, usually, and never. After the video, she gave the students a worksheet with a series of questions about things they may or may not do--i.e., How often do you watch TV? They had to fill out the worksheet with their responses and then they had to find two other people and ask them about their responses. She included us in the activity and it was fun to watch them come up to each of us and ask how often we did something. From beginning to end, Mariel had the students involved in a variety of activities learning English. After the class was over and her students went to music class, she spent time with us to talk about her teaching and ask us about her impressions of the lesson for today. Crystal told her that she wrote down some different strategies that Mariel used because she wanted to try them herself---for example, when she raised her hand in the air to get their attention, all the students when they noticed raised their hands too and eventually the whole class was focused on Mariel. It was wonderful to spend time in her classroom and see what Mariel does to teach students to listen as well as read, write, and speak in English! After our visit to the Colegio Lolek, we took a taxi over to the infamous "Museo de las Momias" (Mummy Museum) of Guanajuato. It is, as the Washington Post has stated, "one of the most bizarre cultural institutions anywhere" (Brubaker, B., 2010). The legend is that in the late 19th century, the city of Guanajuato began taxing people whose relatives were buried in the cemetery. Those who were buried who didn't have relatives or who had relatives but they couldn't pay were exhumed and stored in a warehouse by the cemetery. Many of the corpses were mummified because of the minerals in the soil. Workers at the warehouse began charging people to come in and see the mummies. They grew so much attention that eventually a museum followed. A law prohibiting exhuming bodies was passed in 1958. There are currently over 100 mummies on display at the Museum. We spent some time wondering around the different shops of Guanajuato after we got back and then joined the teachers we had observed and others from the University for dinner. It was a great opportunity for all of us to spend time in an informal setting talking about teaching and learning. It is remarkable how much we all have in common as teachers across both of these cultures. The chance to share strategies and concerns and learn from each other was certainly a great benefit to us all. It was another good day in Guanajuato. Tomorrow is our last full day and we plan on going back to the Language Department at the University to sit in on Karina's TESOL (Teaching English as a Second Language) class. Sammee will be presenting on LOCO (Language Objectives and Content Objectives)--a very fitting word for where we are. 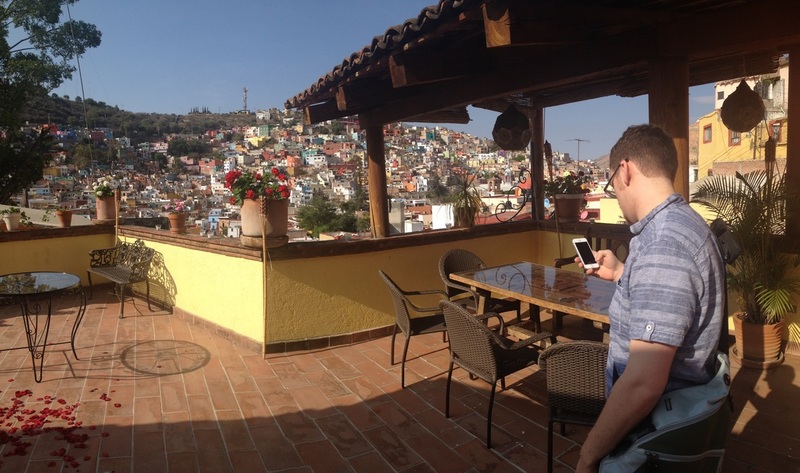 Our last full day in Guanajuato! We had a casual morning breakfast and then headed up to the University. Today, Sammee was giving a presentation in Karina's TESOL (Teaching English as a Second Language) class for the students enrolled in this teaching program. The topic was "LOCO"--language objectives and teaching objectives. 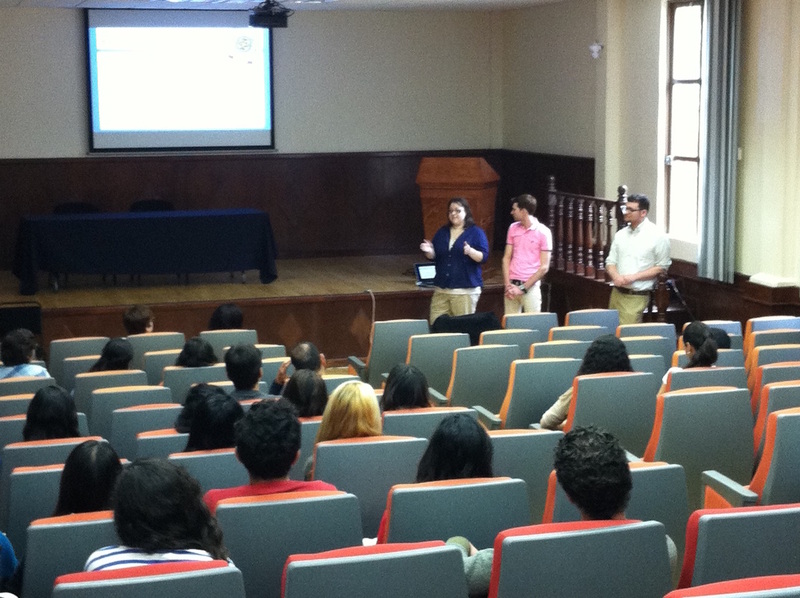 The University of Guanajuato students were great! Sammee began with having everyone write (a requisite for Writing Project workshops) about a teacher that they had at some point who helped them to learn. The stories were fascinating as each person talked about previous teachers who influenced them in different ways or provided personal and academic support. Everyone in the room was either a teacher or studying to be a teacher, and it was good to hear that all of us recognized what it means to have and be a good teacher. After the presentation, we stopped by the University of Guanajuato store and then some of us headed to the "Museo Iconographico del Quijote" (Don Quijote Museum). Along the way we stopped off at this unbelievable chocolate shop tucked away in a small square down from the University. The shop had so many different kinds of truffles---eggnog, tamarind, pina colada, strawberry, tequila, and dark chocolate (to name a few). It was very difficult to choose just one, but we somehow managed! 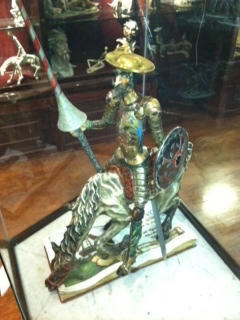 After a rather circuitous route, we made it to the Museo Iconographico del Quijote. This is another landmark in Guanajuato that was established in 1987. 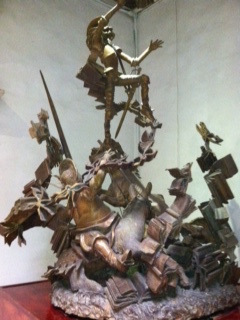 There are hundreds of different pieces of art in seventeen rooms on two floors of the building depicting some aspect of the characters of Quijote, including paintings, sculptures and ceramics. 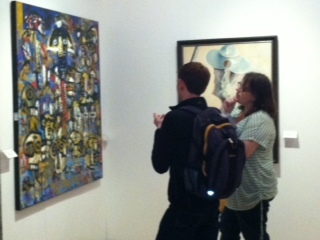 Even if people are not familiar with the story, they can still walk through and appreciate the various artists' renditions of the book. Although the museum was not busy today, it most likely is during the annual Cervantes Festival in Guanajuato that occurs every year in October. People from all over the world come to the city to celebrate Cervantes and his works and everywhere there are plays in the squares and music as well as art. For our last night, we went back to one of our favorite Mexican restaurants--Casa Valedez--and had another fantastic meal. Afterwards, on our way back to the hotel, we heard the minstrels singing "Ay, Ya, Ya, Yai--Cantos y No Llores" and joined in for a bit. What a great lasting memory of Guanajuato! We got up bright and early for breakfast and then loaded ourselves and all our luggage into the van for the ride to the Leon airport. We went from Leon to Houston (and through Customs and Immigration) and on to the Newark airport where we were picked up by our van driver for our ride to the Penn State Lehigh Valley campus. The picture is of all of us in the airport at Newark. And although we had to wait almost an hour for the luggage to get delivered to the conveyor belt, we were nonetheless happy to be back home. Overall, it was a great experience living in and learning about Mexico!